How to play MKV on LG Smart TV, LED TV, LCD TV, Plasma TV and 3D TV? Today’s HDTVs are ultra-connected, able to access all kinds of online content, along with media from your various digital devices. The huge improvement of LG’s screen display must be persuasive that HDTV would be your best choice to watch your collection of HD movies on LG HDTV in high quality playback and unlimited HD movie enjoyment. Question: LG TVs can play all formats video? Some guys like watching downloaded movies on LG smart TV via USB. But the LG TV can’t read some video files, the video format including MKV, AVI and M4V, why we can’t play these formats on LG Smart TV/LED TV/ LCD TV? Question: When I play MKV on LG Smart TV, why the video have no sound? 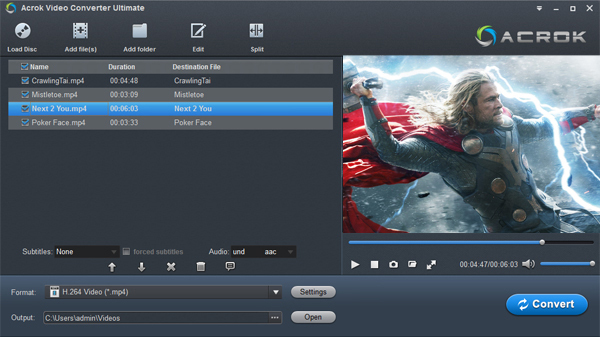 Every MKV can play on a media player, TV or external, if you can’t play MKV on your LG TV/Smart TV/LED TV/LCD TV, just have to transcode it with TV video converter. Answer: Well, LG TVs doesn’t support all MKV videos playback, it supported video formats are mostly MP4 or DIVIX. If you want to play the MKV movies on LG TV/Smart TV/LED TV/LCD TV, you can convert the MKV to MP4 (H.264/AAC) first. Why the video doesn’t have sound? Because the MKV audio format is DTS, LG TVs can’t support DTS audio. So convert it to AAC or AC3 is a good choice. Below is LG TV, Smart TV, LED TV and LCD TV MKV solution. LG TV Video Converter-Convert MKV to LG Smart TV, LED TV, LCD TV, 3D TV and Plasma TV. LG TV Video Converter is a best MKV, AVI, MOV, WMV, MTS, MXF to LG Smart TV/LED TV/ LCD TV converter. With this powerful converter, you can convert all formats video LG TVs supported formats with super-fast speed and keep high output quality. If you like, you can edit any video in LG TV Video Converter. Tip: LG TV Video Converter can rip and convert Blu-ray/DVD video, you can convert Blu-ray/DVD for smooth playback on various portable devices, such as Surface Pro 3, iPad Air, iPhone 5S, Xpeia Z2, HTC One M8/M7, Galaxy Tab Pro, LG G Pad, etc. After run LG TV MKV Converter, add MKV file into this MKV to LG TV converter, you can batch convert videos to videos or merge several videos into one video. Choose output profile: Click “Output Format” bar, choose “Common Video > MP4”. If you want to get HD video, you can choose HD MP4 as output video format. Get 1080P Resolution: For playing 1080P movies on LG Smart TV, LED TV and LCD TV, Plasma TV and 3D TV, you can click “Settings”, select “1920*1080” as output resolution. If you want to get 3D movies, Click the “Edit” button and then select a specific function to open the video editing window. 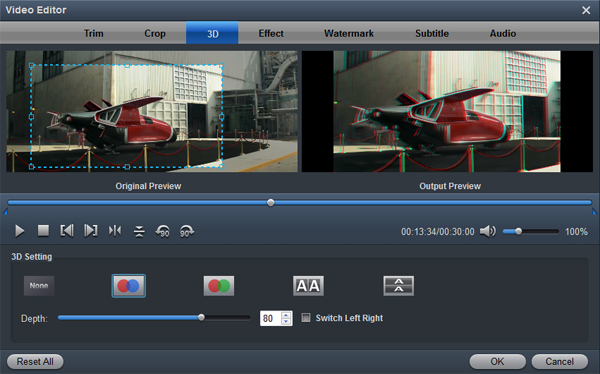 As you see, video editing functions like Trim, Crop, 3D, Watermark, Effect, Audio editor. are provided to let you get the user-defined video as you need. Click “Convert” button to start MKV to LG Smart TV, LED TV and LCD TV, Plasma TV and 3D TV conversion. After conversion, you can click “Open Folder” to get the playable video. Transfer video to USB and playing it on LG TVs. That is how to enjoy MKV movies on LG TVs. Free download this MKV to LG TV Converter and convert MKV movies to LG TV videos for watching on LG Smart TV, 3D TV, LED TV, LCD TV and Plasma TV by yourself. 1. LG TV Video Format, watch all formats on LG TVs. 2. Transfer iTunes movies to LG TVs (LED, LCD, 3D and smart TV). 3. Convert 2D to 3D for playing 3D movies on LG 3D TV. 4. Play MKV movies on LG Smart TV/LEDTV/LCD TV/3D TV and Plasma TV. 5. Enjoy downloaded 3D movies on LG 3D TV.